Deriving from fluid with a pH of 11 these electrons have a redox potential of -650mV, ie they are highly reducing. Under these conditions electrons supplied at -650mV are very able to allow the reaction to proceed to the right yielding CO. Repeating the process yields CH2O and metabolism is on its way. 1. There is no contact between the H2 in the vent fluid and the CO2 in the ocean fluid. 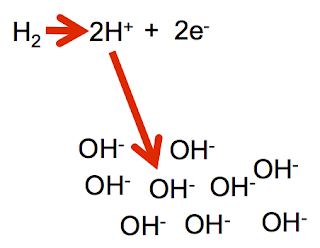 The two Hs in the formaldehyde come from oceanic protons combining with vent H2 derived electrons. 2. I've shown the reaction occurring once to CO and again to CH2O. Why stop at twice? Given a supply of -650mV electrons why not keep generating CO and inserting it, along with e- and H+, in to whatever hydrocarbon you have already got in the vent fluid? Nick Lane has reaction sketches for generating almost all of the Krebs cycle components on this basis. Theoretically, if you wanted to make an origin of life reactor to test whether you can generate a multitude of the hydrocarbons at the core of metabolism you don't actually need a supply of alkaline hydrogen rich fluid. This only supplies electrons at -650mV. An alternative supply would be a 1.5 volt battery with some sort of voltage reduction to get from -1500mV to -650mv and you're away. A microporous FeS electrode in Perrier water, energised by an AA battery via a couple of resistors and you might just be set up. Getting the apparatus anoxic and detecting the products might be more of a challenge! Labels: Life (18) Why stop at formaldehyde? "Why does the reduction of ferredoxin via Ech depend on the proton-motive force? The answer is as yet unknown, but cannot relate to reverse electron flow [as originally proposed (49)] as these methanogens do not possess an electron-transport chain (37,38). A more pleasing possibility is that pH modulates reduction potential at the active site of the enzyme. 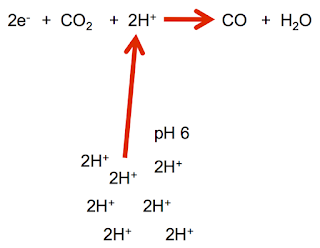 The flux of protons through Ech from the relatively acidic exterior could lower the pH at the active site of the enzyme, which should facilitate reductions that depend on protons, including CO2 as well as some ferredoxins (50)". Aside: If you read the full text of Lane's paper you will take note of Jackson JB (2016) Natural pH gradients in hydrothermal alkali vents were unlikely to have played a role in the origin of life. And this passed scrutineering. Nick Lane does not seem impressed. End aside. "One possibility is that prebiotic carbon and energy metabolism entailed the synthesis of reactive thioesters analogous to acetyl CoA, such as methyl thioacetate, coupled to substrate-level phosphorylation, generating acetyl phosphate and ultimately ATP [1, 17, 27, 60–63] as still happens in bacteria [14, 31]". "Across the barrier, in acidic conditions, CO2 is more easily reduced, and so is more likely to be reduced by Fe2+ in the barrier. 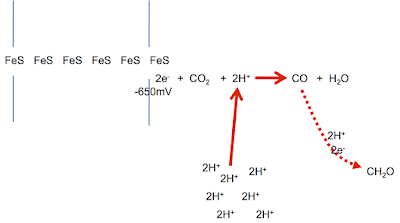 The semiconducting barrier should transfer electrons from Fe2+ on the alkaline side to Fe3+ on the acidic side. The thickness of the barrier does not matter, so long as it is semiconducting. 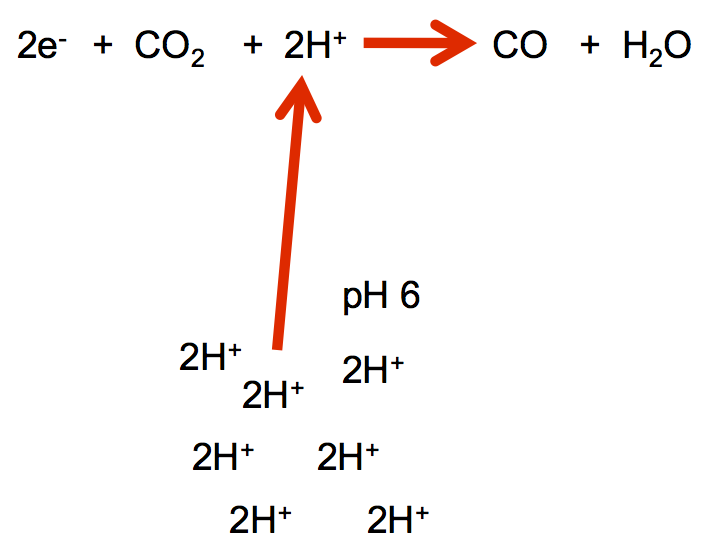 The two phases do not come into direct contact - H2 and CO2 do not react directly (Fig. 3)". This is really neat, it puts in to a published paper many of the logical concepts that went in to the Life series. I really like the pre biotic ideas of electron transfer across any-thickness FeS barriers. No need for membranes, indeed insulating "crud" membranes would hinder electron transfer from the FeS wall to the enzyme, necessitating the generation of a pore like structure (ancestor to NuoH) to get the voltage generating acidic pH to the active enzyme's site. This ferredoxin reduction plus subsequent substrate-level phosphorylation is where it should all start. NuoH starts as a pH channel, not part of a nano machine. That comes later with reversal of proton flow and the development of complex I, a true advanced nano machine. I still don't buy ATP synthase (another very complex nano machine) as running on the primordial vent proton gradient as Nick Lane holds to. Later developing Na+ energetics look much more likely, these following on from Proto-Ech's pore duplication to form a Na+/H+ antiporter, giving a usable Na+ gradient. That clearly post-dates some sort of membrane, which ferredoxin based metabolism must precede when using a geochemical proton gradient. NuoH becomes essential only after a crude membrane forms to impede this process of ferredoxin reduction.